Recently, there have been a number of heritage listed homes sold on 99 year leases. Examples such as the National Trust sale of Juniper Hall and the NSW Land and Housing Corporation sale of 31 properties in Millers Point have been controversial and not well understood by the general public. What is a 99-year lease? A 99-year lease is simply a long-term lease, and the way it works depends on the terms of the particular lease. Lease terms vary depending on whether a lease is residential or commercial, however, almost all leases include terms addressing the length of the tenancy; the amount of rent and deposits the tenant must pay; whether the tenant may sublet or assign the property; and landlord access to the property. Commercial leases tend to grant more of the rights and responsibilities of ownership and they usually include detailed terms about legal rights and making improvements to the property. For a lease term, there is nothing special about 99 years, rather the term of years is intended to convey the idea that the lease runs for the life of the tenant as most individuals don’t live longer than 99 years. Why would someone want to enter into such a long-term lease? A person enters into a long-term lease to acquire the security of property ownership, which is theoretically indefinite, without actually having to purchase the property. There can be many reasons to lease rather purchase real property, but the most common reason to avoid an outright sale is because it is forbidden. For example, some countries only permit citizens to own land, so non-citizens who wish to reside in those countries typically enter into long-term leases. Long-term leases have the benefit of locking in a particular (hopefully low) lease payment, whereas a mortgage payment or a short-term lease will fluctuate with interest rates and the real estate market. Though the 99-year lease term may be derived from the individual lifespan, this type of lease is not restricted to use by individuals. Indeed, such long-term leases are usually used in the commercial context, for businesses, rather than in the individual, residential context. Private companies often enter into long-term leases for use of government land. For example, most ports are run by private companies, but the ports themselves are government property. In order to house the employees and business infrastructure, a company might lease a building on the port for a term of 99 years. As well, restaurants, bars and other location-sensitive businesses may enter into a long-term lease because the success of the business depends on staying in that particular location. How does the lessor ensure that proper maintenance is carried out in the last few years of the lease term? What happens if the owner sells the freehold reversion at some point during the 99 years? Why did National Trust sell Juniper Hall on a 99 year lease? Sadly, the National Trust does not have the funds to maintain Juniper Hall on an ongoing basis. The National Trust, as a non-government charity, does not receive sufficient funding from governments of every level to maintain its large portfolio of historic buildings and as a result they were forced to prioritise. Juniper Hall was purchased and restored by the National Trust during the 1980s following many years of being under threat of demolition. According to the Trust, they have approached the state and local government seeking any expression of interest of government ownership of the property, but was unsuccessful. The Trust has also been unable to secure a lease that has generated sufficient income to allow the property to be self-funding. They realised that lessees would not be prepared to spend sufficient money to upgrade or maintain the building unless they were granted a long term lease. The National Trust required as a condition of the sale of the 99 year lease that the successful bidder provide a bond for the immediate maintenance needs of Juniper Hall. Any works that proposed to the building are required to be undertaken in accordance with the requirements of the Juniper Hall Conservation Management Plan and will need the approval of the Heritage Council. The Moran Family was the successful bidder. They plan to restore Juniper Hall and have proposed that it will be the home of the Moran art prizes sponsored and administered by the Moran Arts Foundation Ltd. The original four rooms on the ground floor are to be used for portrait and photographic exhibitions, with access by the general public on most days of the year. The first floor and attic are proposed to be converted into a private residence for family members. The family have a long history of restoring historic properties and the result appears, on balance, to be a positive one. 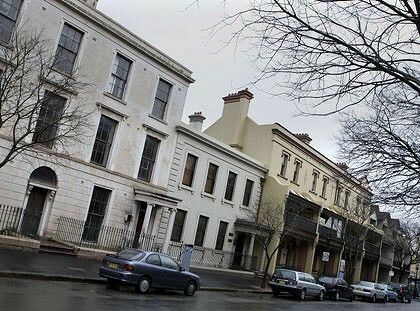 Lower Fort Street (Photo Source: Dallas Kilponen, Sydney Morning Herald, August 14, 2010). Since 2008 the NSW Government has sold 31 properties in Millers Point on 99-year leases. According to the Government, the sale generated in excess of $39 million in revenue which is said to have contributed towards the development of new social housing at inner urban locations. They are evaluating potential for further sales, following a social impact assessment. The Government argues that properties are of limited value as social housing for two reasons. Firstly, many are unsuitable for elderly tenants or those with special needs as they are heritage listed older buildings which cannot be modified to meet modern requirements. Secondly, a large number of them require substantial renovation and maintenance work, which due to their heritage nature, is very expensive relative to other social housing.